Is this one lol enough? I just love that pic haha! Ohhh, I am sorry, I did promise to find my LOLs but then WLB arrived today and and.... I'll go get them now. And bahahah, that is priceless Lara. Ok, that last picture surprised me completely. I did some LOLTarja captions, let's see if I can find them all. OMG those are hilarious! I hadn't seen the umbrella one, and the mic one is just epic! YAAY, your LOL!Tarjas still crack me up, Karina. I love them!! OK, here are all the ones I could find. There were too many to post as images so I made them clicky thumbnails. Didn't Lady Christabel make a LOLTarja out of the "Tarja fixing herself a sininen enkeli" one, too? 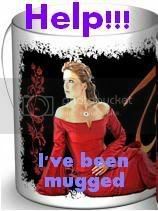 ROTFL @ I've been mugged. OMG. HAHAHAHAHAHA. ROFLCOPTER! Some of them I already knew, but not all of them! Gosh, they are so funny! Bahahah, great ones, guys! 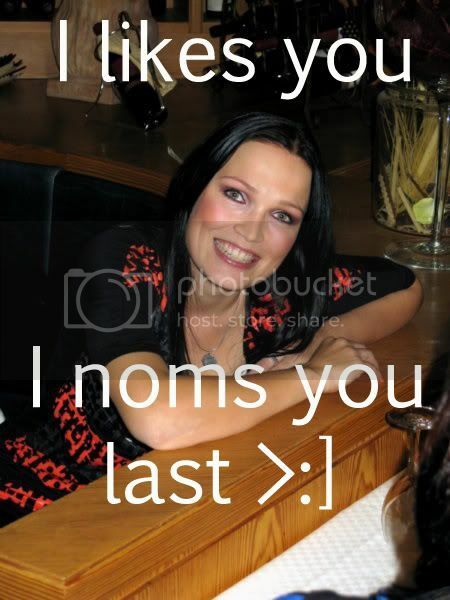 Aww, LOL!Tarja really makes me laugh too much. x) Haha, Lara, I never DID understand what was going on in that picture where Tarja is in the pit. I guess if we are getting personal I will just have to take some revenge. Remember this one? i think what happened was that she went down there to greet fans or whatever, and then Mike started throwing drumsticks, so all the fans were paying attention to him, and Tarja got very confused. Ohhh! That explains a few things. How could they don't see Tarja? I'd like to be there, so Tarja'd be only mine!